A Florida mayor is the latest Democrat to launch a campaign for next year's US presidential nomination. 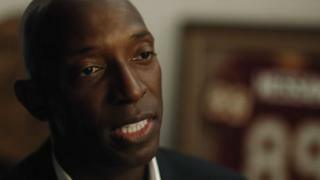 Wayne Messam, the 44-year-old son of Jamaican immigrants, focused on the idea of the American dream in his campaign video released on Thursday. He became the first black mayor of the southern Florida city of Miramar in 2015 and is the second sitting mayor to declare a White House bid this year. He joins a crowded field of over a dozen Democratic contenders. "I'm passionate about the American dream because it's not a fictitious thing for me," Mr Messam says in his launch video. "The promise of America belongs to all of us, that's why I'm going to be running for president - to be your champion." Like many of his fellow competitors, Mr Messam's video touched on issues of healthcare, climate change and student debt, saying: "Washington is broken." Could the mayor of a modest-sized town nestled in the urban sprawl of southern Florida be elected president? It seems highly unlikely, but such is the nature of US presidential politics these days that even the very unlikely can't be dismissed as impossible. Wayne Messam of Miramar will tout his personal story, as the child of Jamaican immigrants, more than his relatively thin political record in hopes that it catches the eye of Democratic voters. Mr Messam isn't the only mayor - or former mayor - to have jumped into the race. Pete Buttigieg, from the even-smaller town of South Bend, Indiana, has recently seen a surge of interest in his campaign, due to well-received appearances on cable news. His early success can only be encouraging for the Miramar politician. If there is a path to the nomination for Mr Messam, it runs through South Carolina, which holds its primary shortly after Iowa and New Hampshire. If the mayor can form a bond with the Democratic voters there, a majority of whom are black, he might be able to carve out a bit of the spotlight and use it to boost his prospects in contests throughout the south. Mr Messam is a former star athlete - he attended Florida State University on an athletic scholarship, eventually winning the 1993 national American football championship. He then went on to open a construction company, which has been one of the fastest growing minority-owned businesses in the US, according to CBS News. Mr Messam unseated a 16-year incumbent in 2015 and has served as mayor of the city of 140,000 since then. Pete Buttigieg, Mayor of South Bend, Indiana, is also running for the 2020 Democratic presidential nomination, vying with the likes of Senators Elizabeth Warren, Kirsten Gillibrand, Kamala Harris, Cory Booker and Bernie Sanders.